Penn Engineering teaches quantitative analytical skills necessary to innovate and solve technical problems, and Wharton teaches qualitative analytical skills necessary to collaborate on teams and make sound business decisions. M&T students have the unique privilege of simultaneously learning both sets of skills, making it the ultimate pre-professional education. I intend to work in the medical device industry at the intersection of engineering and business, hence my decision to study bioengineering and finance. I could not think of a better place to do so. Any concerns that my peers or I had entering this intense program our freshmen year quickly became a non-issue. M&T students have access to three great advisors to assist them in planning their courses of study, guide them towards exciting research and internship opportunities, and connect them with the extensive M&T alumni network. And if all of that support was not enough, M&Ts are also assigned faculty advisors in the School of Engineering and Applied Science, along with advisors at the Wharton School, to help them even better navigate their undergraduate education. Danielle came to Penn from Flemington, New Jersey and is currently Social Committee VP on the M&T Club Board. She studies Bioengineering within Penn Engineering and Finance in the Wharton School. Our generation faces increasingly diverse and complex issues that span from environmental issues to poverty to terrorism. In M&T I have friends who are using the valuable skill set that they hone through the program to address these issues efficiently and effectively. For each of these seemingly impossible problems, M&Ts are pioneering technologies that can revolutionize the way we think and solve these problems, and equally as important, utilizing business acumen to execute and scale these technologies to make measurable, quantifiable impact. Yesterday it might have been enough to stay within one area of expertise. Today we need a wider skill set and diverse perspectives to foster innovation that can truly drive change. From what I have seen from the M&Ts I know and love and the alumni working in a bewildering diversity of industries, I can say that whatever M&Ts are doing, M&Ts are out there tackling problems head-first and making an impact on the world. Winnie hails from Cherry Hill, New Jersey and is currently Webmaster for the M&T Club Board. She studies Systems Science within Penn Engineering and has yet to declare her concentration in the Wharton School. The M&T Program’s differentiating factor is its combination of an individualized education and an extensive network. To most colleges these two ingredients are mutually exclusive. I had a difficult time finding a university which simultaneously emphasized the individual and fostered a community, that is, until I discovered the M&T Program. Although immersed in a college community of over 20,000 students, I receive individualized attention. The M&T staff provides guidance and resources to ensure that every M&T student makes the most of his/her education. M&T alumni remain connected to the program and offer opportunities and assistance to current students. 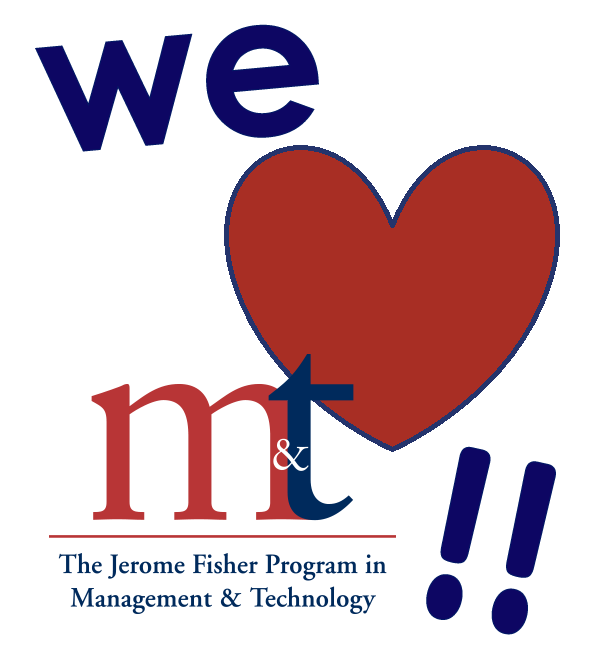 Although M&T students are presented these program-specific opportunities, we also enjoy the advantages of the larger Penn community. M&T students are among the most academically, humanitarianly, and socially active students at Penn. You will find M&T students in just about every club and involved in almost every school-wide activity. Ultimately, the M&T Program is my ideal college setting because it grants me the rare combination of individualized attention and limitless opportunity. Connor, originally from Newnan, Georgia, is on the Corporate Committee of the M&T Club Board. He is contemplating studying Computer Science within Penn Engineering and has yet to declare his concentration in the Wharton School. M&T is a great program because although the academic rigor is unparalleled and puts you in a unique position to get fantastic jobs and other opportunities, students in M&T are also very social. There is a real sense of community and pride in helping each other out in a variety of pursuits, both academic and personal. Some of my best friends are in the M&T program and they have helped me get the most out of this fantastic institution. Jeff came to Penn from New York, New York and currently sits on the Social Committee of the M&T Club Board. He studies Computer Science within Penn Engineering and has yet to declare his concentration in the Wharton School. The M&T program has allowed me to pursue my interests in both engineering and business without giving up the technical or qualitative skills necessary for each one. The complete degree from both schools allows for almost endless possibilities with the combination of skills that we learn in the M&T program. But beyond what we learn in the classroom, the people who are in this program are what make it so incredible. The close-knit community has fostered my closest friendships at Penn, as we work hard and play hard together. This community is one that will stay with me for the rest of my life. Lauren, originally from Boise, Idaho, sits on the Corporate Committee of the M&T Club Board. She studies Computer Science within Penn Engineering and has yet to declare her concentration in the Wharton School.